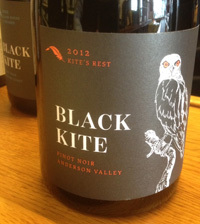 2012 Black Kite, Pinot Noir, Kite’s Rest, Anderson Valley. Black Kite is one of the most prized Pinots in the state and the 2012’s are some of the best wines to date from this winery, if you’ve not had a chance to try them, this is the time. Well respected winemaker Jeff Gaffner of Saxon Brown, crafts all the Black Kite wines, which are mostly from single vineyard Anderson Valley sites, though Black Kite has expanded and now includes wines made from the Santa lucia Highlands, will fruit coming from Garys’ Vineyard and Pisoni’s newest star, Soberanes Vineyard. The Anderson Valley bottling remain the stars here, and I was thrilled to taste though a set of 2012’s, which were of top quality and certainly well crafted, the Stony Terrace made from Rochioli clone was an eye opener and was my favorite of the set, but the best value and not far off was the Kite’s Rest, a most true Anderson Valley terroir wine in style with slightly lower alcohol and a bit more tension, live and vibrancy. The 2012 Kite’s Rest is by far the best version of this wine that I’ve tried, it shows more finesse, transparency and still has depth and hedonistic pleasure, when people imagine balance, this is what they are hoping for and there is subtle oak influence along with (ripe) nice fruit intensity. The nose begins the journey with dried roses, tea spice, hints of violets and red currants coming from the glass of this brilliantly ruby hued Pinot leading to a succulent palate of black cherry, juicy plum, raspberry, strawberry and cranberry fruits mixed with hints of stones, saline, chalk, smoke, vanilla and cinnamon plus anise, earthy tones and red peach. The mouth is filling, playing with vivid flavors, round texture and lifting acidity, gaining some weight, but never heavy or dulling, this is beautiful and rewarding Pinot Noir, drink from 2015 to 2019.